A mini oven can be a life saver if you have a small kitchen and want to make the most of space. I’ve also found that they are great for if you want to do small amounts of baking too though. If I have a small batch of cupcakes (often a good idea with my love of them!) then I might not want to turn a huge oven on in order to cook them. I find that being so small the cook really well and evenly which is just what I need! So if you’re considering one read on for my guide on choosing the best mini oven along with some of the best models available in the UK at the moment. Scroll below for my top choices or look here for my number one choice. do you have space for it – they are generally small and compact but they need space as they heat up lots obviously. what your budget is – generally mini ovens are fairly inexpensive but really cheap mini ovens often means small. Bear that in mind! Once you’ve thought about your requirements you can then think about the specifications you’ll need when looking for your ideal oven. Size is the main consideration that should be thought about first really. You can get mini cookers in many different sizes from as small as about 9l in volume up to about 42l. As you can see, it’s quite a difference and will dictate what you can cook inside. A tiny one won’t be able to cook a joint of meat for example, yet a bigger one should accommodate it with no worries. If you’re planning on baking bread you’ll want to know it has room to rise and not hit the top too! Mini ovens are great for single people or couples or just if you cook very small items. 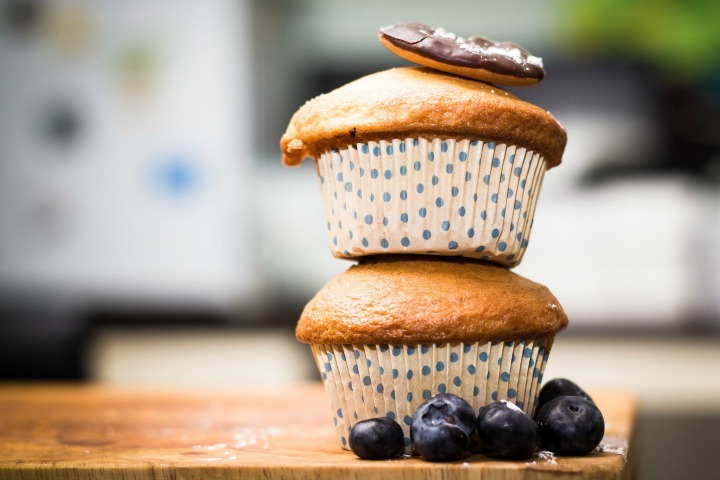 Even the smallest will cook some chips easily or a small pizza, or even some lovely cupcakes! The power of the oven should also be thought of. Bear in mind the wattage of the product and how much power it will take to use it. You’ll need to consider the space it needs and where you’ll situate it. Often they are fine on work surfaces and countertops, but be aware that it’s ideal for them to have some space around them as they heat up – you don’t want them in a cluttered area. You can also get mini grill ovens that are multi functional – most of them will have a grill option but often others will have hobs on the top as well which can be a lifesaver in small areas such as caravans, boats or bedsits. They are perfect for first homes or students as they can be an inexpensive way to furnish your kitchen with a good oven! Ok, so now we know what to look for, let’s have a look at some mini oven reviews and check out the best rated products available in the UK right now. The smallest of the mini ovens I’m looking at today is this one from VonShef. It’s a 19L oven which can take many foods from a frozen pizza to even cooking a small chicken. One of the great things about this oven is that it heats up really quickly and also cools down really quickly so quite safe in that regard. There are 3 dials to control the oven – one controls the time that it’s on with a timer to alert you when it’s done, one controls the temperature and the other to control which heating elements you need (oven or grill). It also comes with a small shelf and baking tray. You also get a 2 year warranty with the product which considering the price I think is excellent value. Check out more reviews and the latest price on Amazon here. This mini oven from Andrew James is all you need for a small kitchen all in one product because not only does it have the oven and grill functionality but it’s also got 2 hotplates as well. 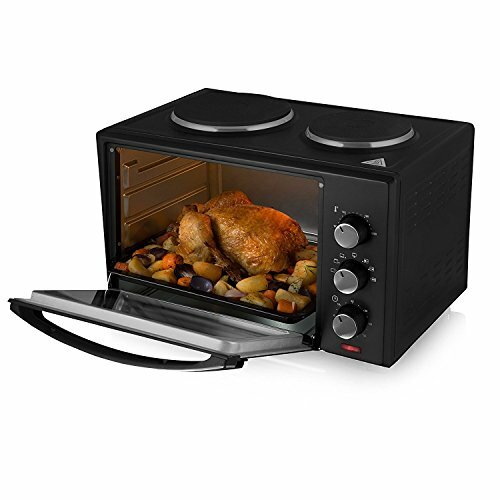 This makes it perfect for small spaces, first homes or even offices and definitely gets it the best mini oven with hob title. It would even suffice as a temporary oven for families too if you needed one, it’s big enough and can certainly cope! You’ll need to bear in mind the space for this kind of mini oven as having the hobs on top means you need plenty of height for it. The oven works really well even though it has so many options. It is large enough for a roast dinner but not too big that it’s going to overpower the kitchen. As I said before it’s plenty big enough for a family although after a while you might find it restrictive. If you’re a small household it would be perfect. The temperature goes up to 230 degrees C. You get a grill rack for inside plus a non stick baking tray as well. The hot plates are two different temperatures – 700W and 1000W. The lower hob is perfect for just warming food while the larger one is good for frying. This is the biggest of the mini ovens being reviewed here and is 42L. The size makes it perfect for families, holiday homes or caravans – you can do lots in it and it’s really versatile. Like the Andrew James mini oven it has 2 hot plates on the top of the oven so can be useful in cooking a variety of items. It’s a lovely black design with chrome effect accents and it looks really good on the work surface. You get a wire rack and baking tray designed to fit inside perfectly. It’s one of the more expensive models but Tower is a well respected brand and it’s a really robust item. I’d definitely think that it will last a long time! You also get a 3 year guarantee with this item. A real premium product is this mini oven by Sage (which is backed by the Chef Heston Blumenthal – it’s quite a spectacular range of premium kitchen products!) and it is definitely superior in many ways. This oven would be great if you were planning to use it day in, day out and needed something that would be up to the job. 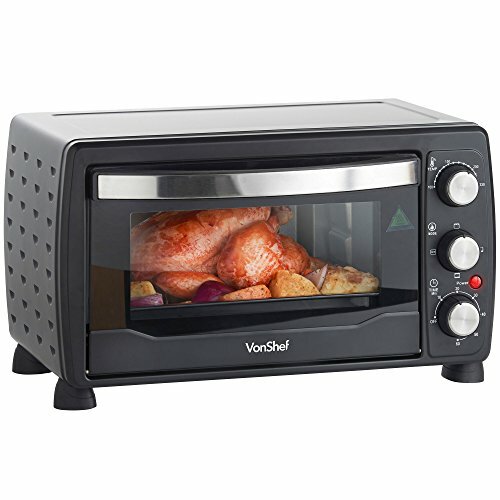 The size is 21 L so not the biggest of the lot, however it is definitely worth considering if you’re looking for a classy mini oven. It looks fantastic, in line with many of the other Sage products, and would look amazing in any kitchen with the silver outer, large digital display and easy to turn knobs. It has an Element IQ technology which is 5 different heating elements in the oven to enable you to bake, grill or cook whatever you like with control. Some things need even heat, some need more at the top and this let’s you control that. 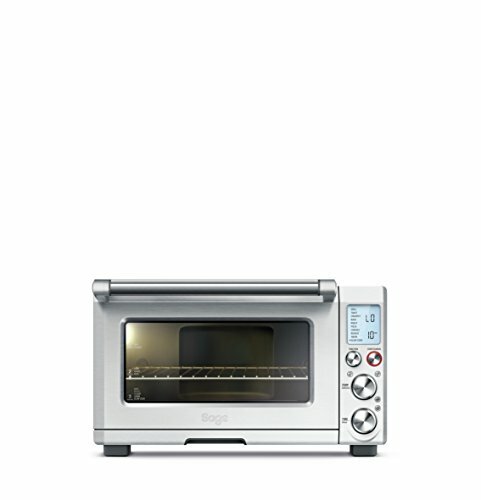 It’s really rather clever and probably the best mini oven for baking as you can control so much. 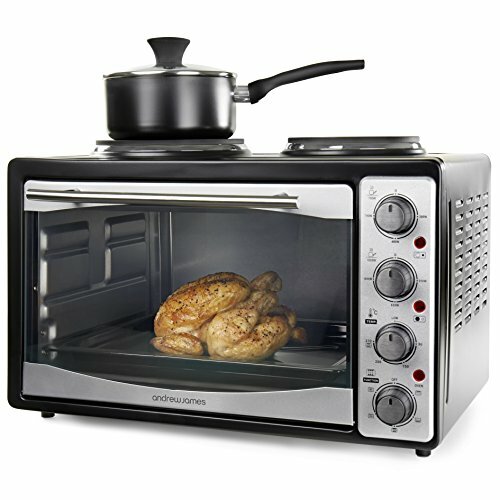 I’m currently researching and testing some more ovens to make this a much more in depth mini oven review guide – check back soon for more ideas!